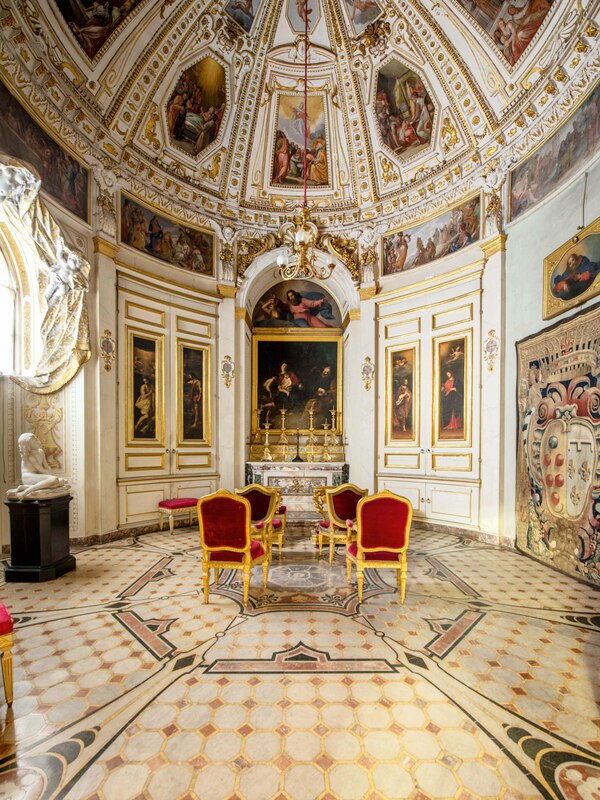 Chapel of the Relics of the Pitti Palace, General views. 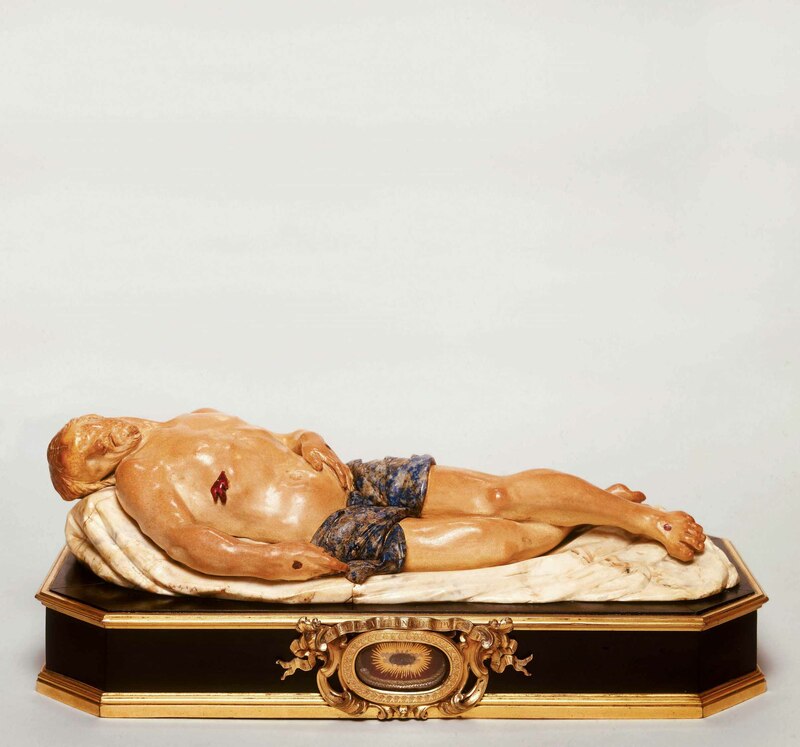 FLORENCE – « This exhibition, devoted to a reconstruction of the treasure in the ‘Chapel of Relics’ in Palazzo Pitti, as the subtitle beneath the succinct but evocative title ‘Sacred Splendour’ tells us, means that almost four centuries later we will be able to rediscover in all its magnificence the forgotten and now dispersed identity of a perfect domestic sanctuary inside the Medici residence inaugurated in the course of a solemn ceremony in 1616. » (Cristina Acidini). With these words in the exhibition catalogue, Director General Acidini introduces this exhibition held in the state rooms of what were once the Medici family’s summer apartments, now the Museo degli Argenti. Situated on the piano nobile of the Medici residence next to the apartments set aside for Tuscany’s grand duchesses, for over one hundred and thirty years the Chapel of Relics played the role of schutzkammer for one of the largest and richest collections of reliquaries and other items of devotion in Europe, comparable in terms of sheer magnificence to the collection of the kings of Spain at El Escorial. 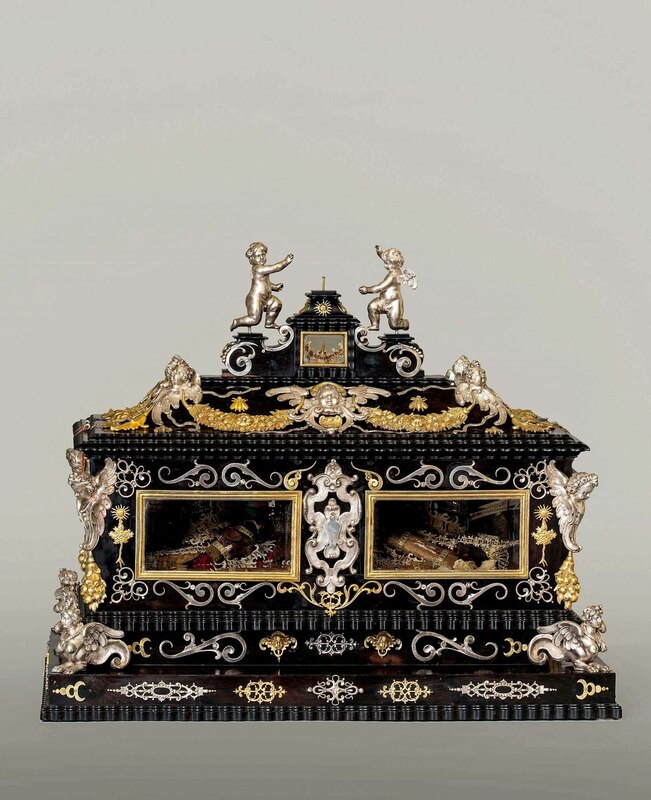 German manufacture, Encolpius Reliquary, in the third quarter of the fourteenth century , silver embossed, chased, engraved and gilded parties to the merger; translucent enamels;pearls; precious and semiprecious stones. Florence, Palazzo Pitti, Museo degli Argenti. This astonishing heritage, comprising almost one thousand items of incalculable worth, was dispersed from 1785 onwards. It owed its dispersal in part to its very magnificence: the gold, silver, precious stones and other valuable materials making up many of the reliquaries were used to replenish the coffers of the Grand Duchy of Lorraine, whose ruling house had become Tuscany’s new overlords after the death of Gian Gastone, the last Medici grand duke. engraved silver and gold, the parties to the merger; rock crystal ground; Coral. Florence, Palazzo Pitti, Museo degli Argenti. 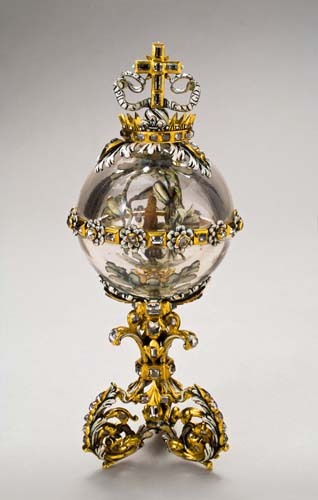 The event that triggered the dispersal of the prestigious collection in 1785 was Grand Duke Pietro Leopoldo’s wish to acquire some semi-precious stone vases which had belonged to Lorenzo the Magnificent, the most illustrious member of the Medici family, from the Basilica of San Lorenzo in order to enrich the collections in the Royal Gallery of the Uffizi. 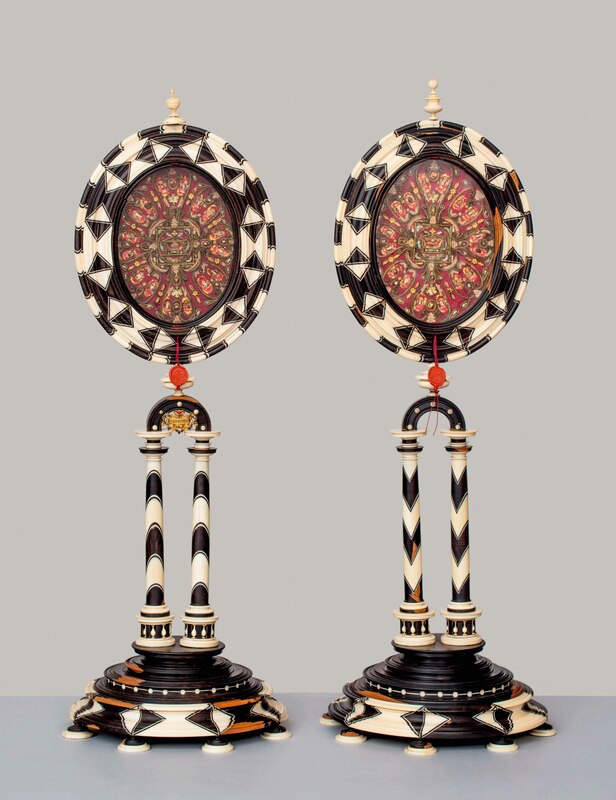 The vases had been bought back on the antique market by the two Medici popes, Leo X and Clement VII, then transformed into reliquaries by Clement VII and donated by him to the Basilica of San Lorenzo. 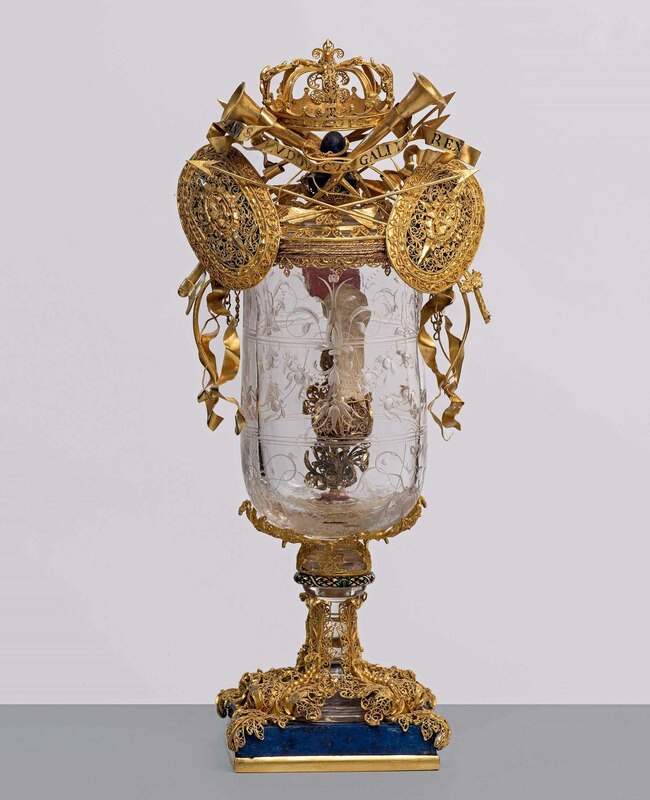 In exchange for the vases – now preserved in the Museo degli Argenti – the basilica was given almost one hundred reliquaries from the collection in the Chapel of Relics. A few months later, Pietro Leopoldo ordered a complete reorganisation of the items still in the palace, which led to the Chapel of Relics being dismantled and twenty-nine reliquaries being moved to the new Palatine Chapel on the ground floor of the palace, entered directly from Ammannati’s courtyard. 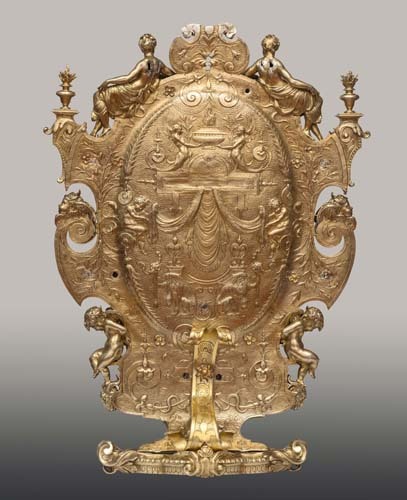 Other reliquaries were given to the then archbishop of Florence, Antonio Martini, who proceeded to share them out amongst the parish churches of the diocese, but all trace of this operation had been lost. Etienne Delaune (attr.) 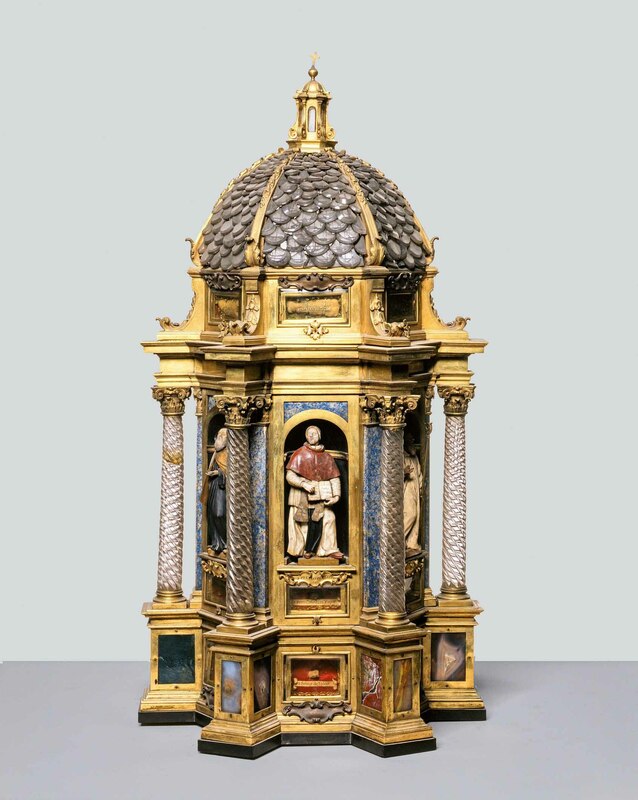 (1518/1519 circa – Paris, 1583) & Andrea Tarchiani (Florence, news since 1605 – † 1647) Reliquary of wood croce, 1561 (main building) after 1622 (the risen Christ, angels and cherubs’ heads) gold engraved and enamelled;silver embossed, chased, engraved and gilded parties to the merger; opaque and translucent enamels; onyx; agate; carnelian; turquoise; lapis lazuli Florence, Palazzo Pitti, Museo degli Argenti. 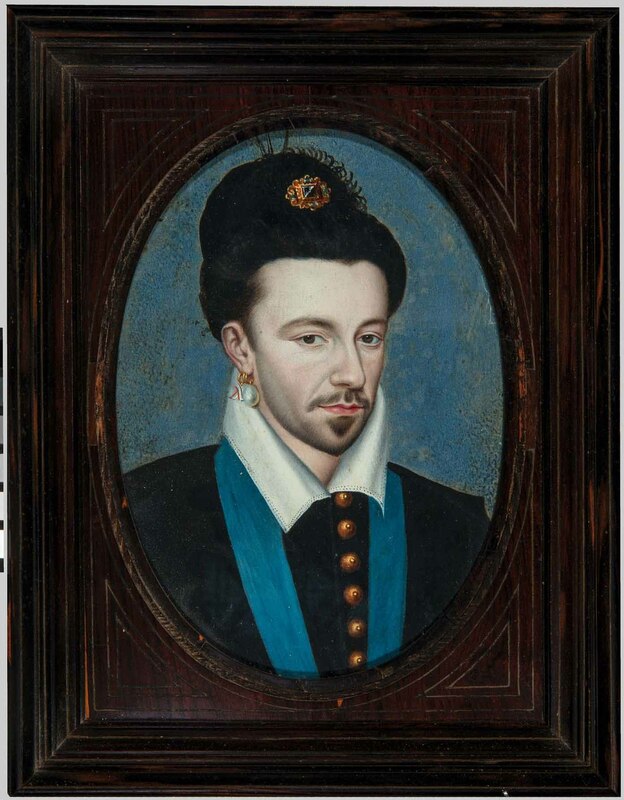 French painter, Portrait of Henry III of France 1575-1589, parchment; carved ebony; silver. Eliseus Libaerts (attr.) (news 1565-1572), and designed by Étienne Delaune (attr.) (1518/1519 circa – Paris, 1583), Merlini Cosimo the Elder (Bologna, 1580 – Florence, 1641), Andrea Tarchiani (?) (Florence, news since 1605 – † 1647) Reliquary of the tree , 1560-1565 (frame receptacle) before 1637 (the risen Christ, base and stem) molten gold and engraved; silver embossed, chased, engraved, etched and gilded parties to the merger; opaque and translucent enamels; pearls; agate grinded Florence, Palazzo Pitti, Museo degli Argenti. Eliseus Libaerts (attr.) 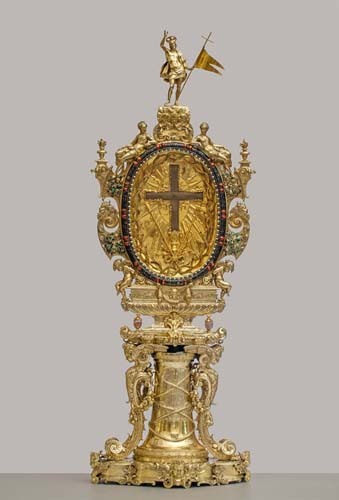 (news 1565-1572) and designed by Étienne Delaune (attr.) (1518/1519 circa – Paris, 1583), Merlini Cosimo the Elder (Bologna, 1580 – Florence, 1641), Andrea Tarchiani (?) (Florence, news since 1605 – † 1647) Reliquary of the tree 1560-1565 (frame receptacle) before 1637 (the risen Christ, base and stem) molten gold and engraved; silver embossed, chased, engraved, etched and gilded parties to the merger; opaque and translucent enamels; pearls; agate grinded Florence, Palazzo Pitti, Museo degli Argenti. 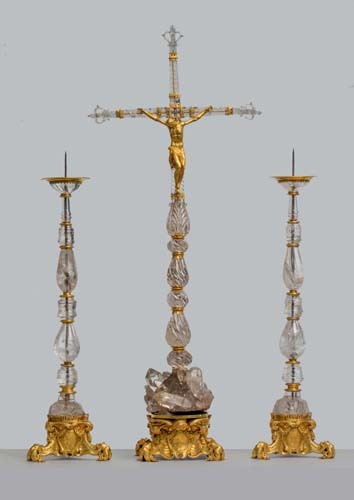 Pietro Tacca (Carrara, 1577 – Florence, 1640), Shops Grand Ducal design by Matthew Nigetti (Florence, 1570-1649) Hilt altar (altar cross and two pairs of candlesticks) 1632 cast bronze, engraved, gilded and rinettato; rock crystal ground; Golden brass; Glass Florence, Basilica of the Annunciation. 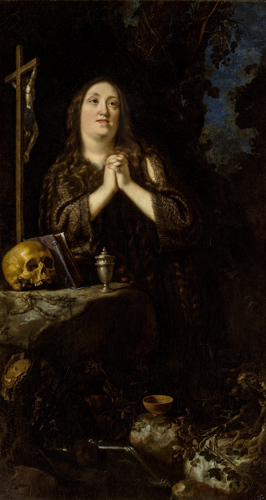 Just Suttermans (Antwerp, 1597 – Florence, 1681) Portrait of Maria Magdalena of Austria in the guise of St. Mary Magdalene, 1625-1630 oil on canvas Florence, Palazzo Pitti, Palatine Gallery. 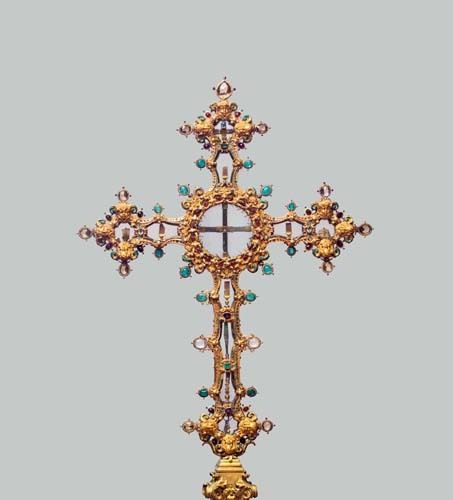 Merlini Cosimo the Elder (Bologna, 1580 – Florence, 1641) & Holzmann Bernardo (Florence, news from 1685 – † 1728), Cross – reliquary of the Passion from 1615 to 1618 in 1700 (base). Florence, Museo dell’Opera di Santa Maria del Fiore. 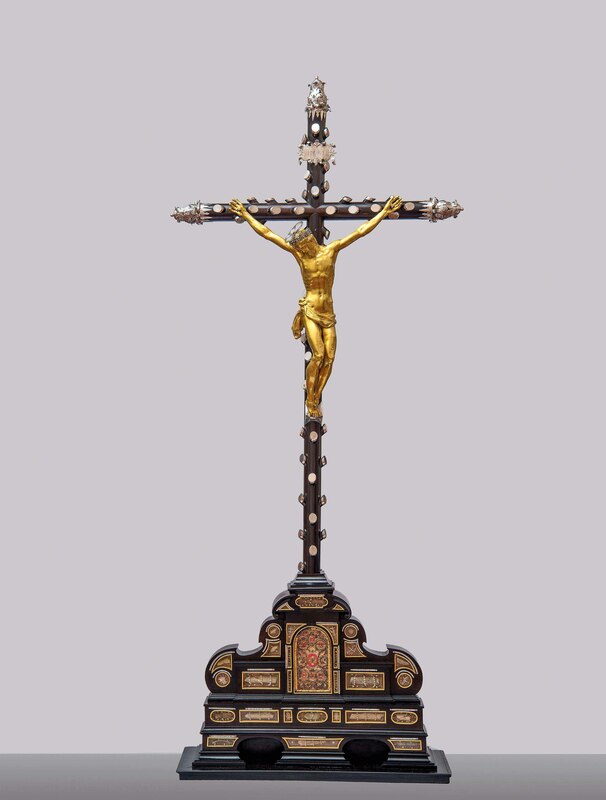 Antonio Susini (Florence, 1550-1624) as a model by Giambologna (Douai, 1529 – Florence, 1608) & Shops Grand Ducal, crucifix reliquary, first quarter of the seventeenth century cast bronze, chased and gilded; molten silver, chased and gilt; gilded copper; carved ebony Florence, Palazzo Pitti, Museo degli Argenti. 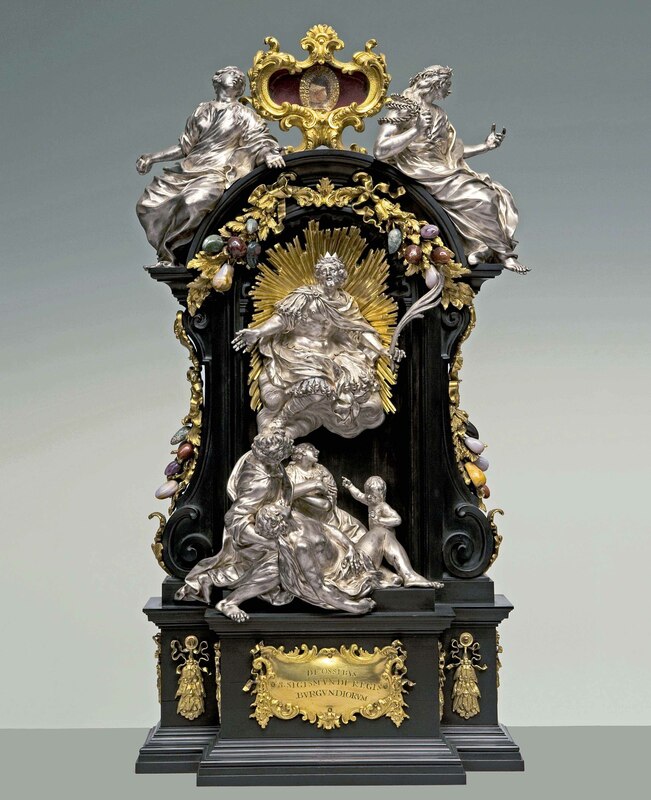 Grand Ducal workshops, Pair of reliquary monstrance, early seventeenth century, inlaid ebony and polished; ivory inlaid and polished; carved wood; molten copper, engraved and gilded; enamels; silk; Glass. Florence, Palazzo Pitti, Museo degli Argenti. 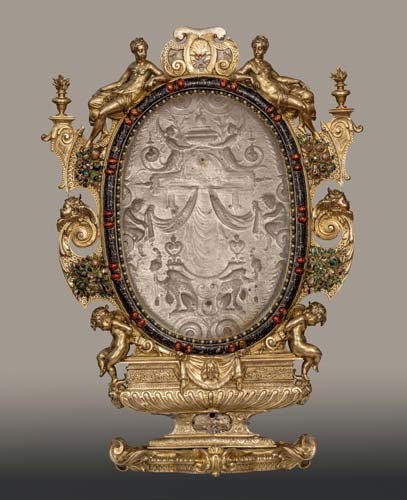 Grand Ducal workshops, Reliquary multiple small altar, the first decade of the seventeenth century, silver embossed, engraved and gilded parties to the merger; oak veneered ebony; semi-precious stones (lapis lazuli, red jasper, agate); stained glass. Empoli, Collegiate Church of Sant’Andrea. 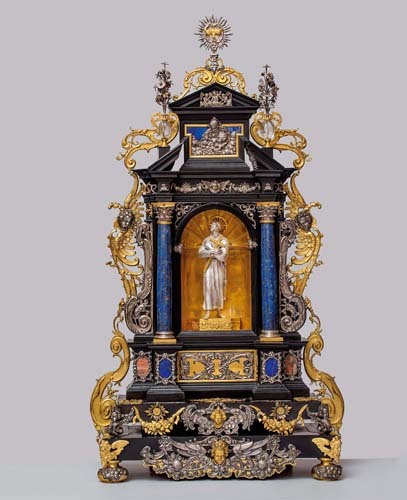 Grand Ducal workshops, Altar with statue of St. Francis of Assisi, early decades of the seventeenth century (structure), half of the seventeenth century (statuette) and cut ebony veneer; silver embossed, chased and gilt, parties to the merger; molten copper, chased and gilt; rock crystal ground; lapis lazuli;agate. Florence, Palazzo Pitti, Museo degli Argenti. 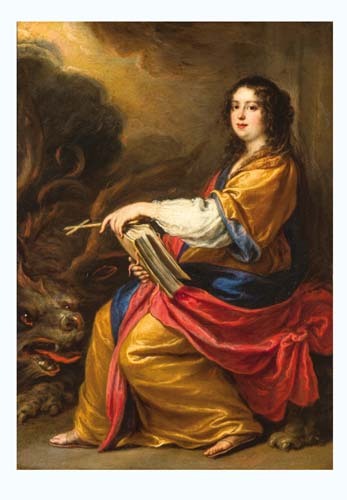 Just Suttermans (Antwerp, 1597 – Florence, 1681), Portrait of Vittoria della Rovere in the guise of St. Margaret, 1639-1642, oil on copper. Florence, Palazzo Pitti, Palatine Gallery. 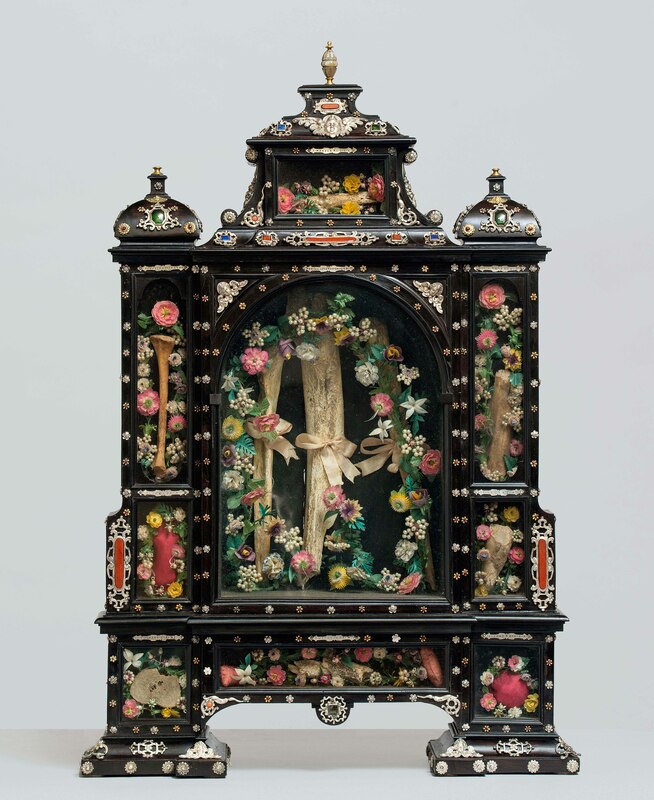 Reliquary of St. Stephen Pope and Martyr and other saints, third decade of the seventeenth century; rosewood worked guilloche; silver embossed and engraved, parties to the merger; gilded copper;cut crystal. San Casciano Val di Pesa, Campoli, Pieve Santo Stefano. Milan Shops Grand Ducal, Reliquary of St. Louis IX, King of France / Reliquary of St. Louis IX, King of France, third quarter of the sixteenth century (vessel) last quarter of the seventeenth century (frame); rock crystal carved and polished; gold filigree; opaque and translucent enamels; lapis lazuli; molten silver, chased and gilt. Florence, Pitti Palace. 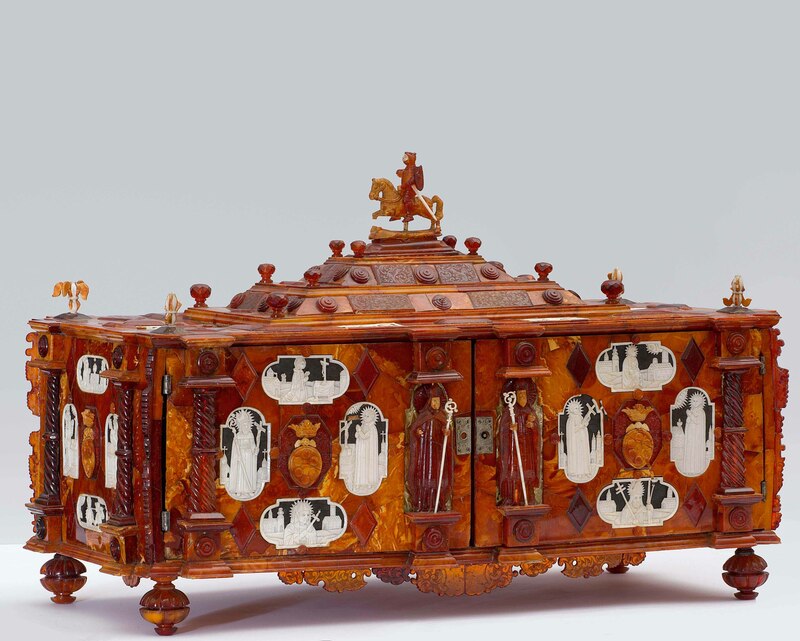 Danzig manufacture, Casket of St. Casimir, circa 1677-1678; several different varieties of turned and carved amber; carved wood; cast and engraved silver; carved ivory; gilded metal. Firenze, Palazzo Pitti, Museo degli Argenti. 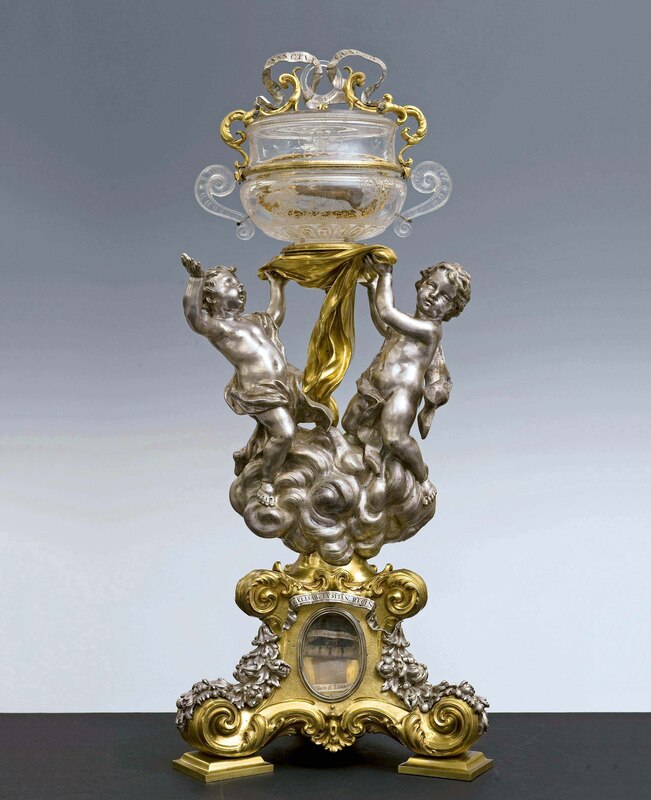 Massimiliano Soldani Benzi (Montevarchi, 1656 – Galatrona, 1740), Reliquary of St. Casimir, 1687-1688; repoussé, chased, engraved, partly gilded silver, some parts cast. Firenze, Museo delle Cappelle Medici. 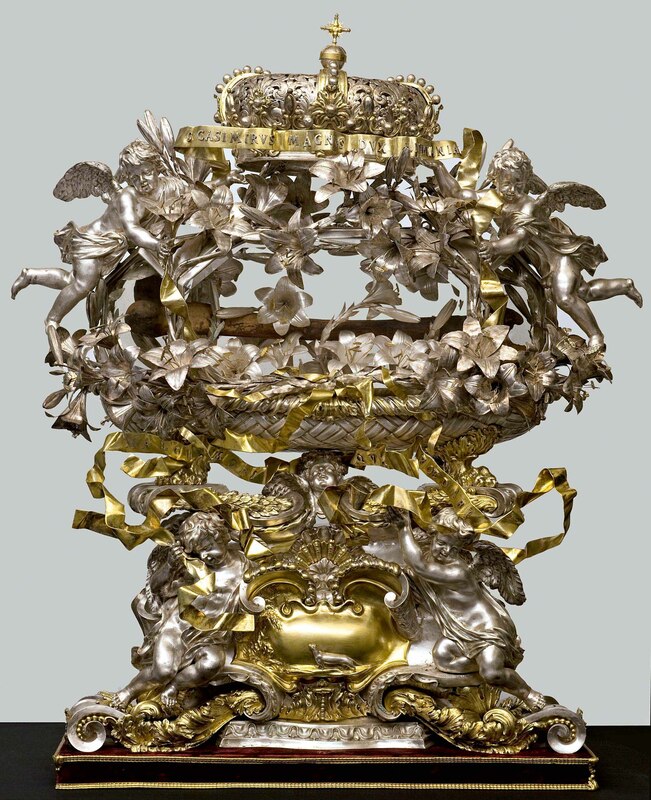 Massimiliano Soldani Benzi (Montevarchi, 1656 – Galatrona, 1740) & Pietro Motti (Firenze, news from 1672 – † 1723), Reliquary of St. Alexius,1690-1691;repoussé and chased silver; chased and cast gold; gilded copper; semi-precious stones; ebony. Firenze, Museo delle Cappelle Medici. 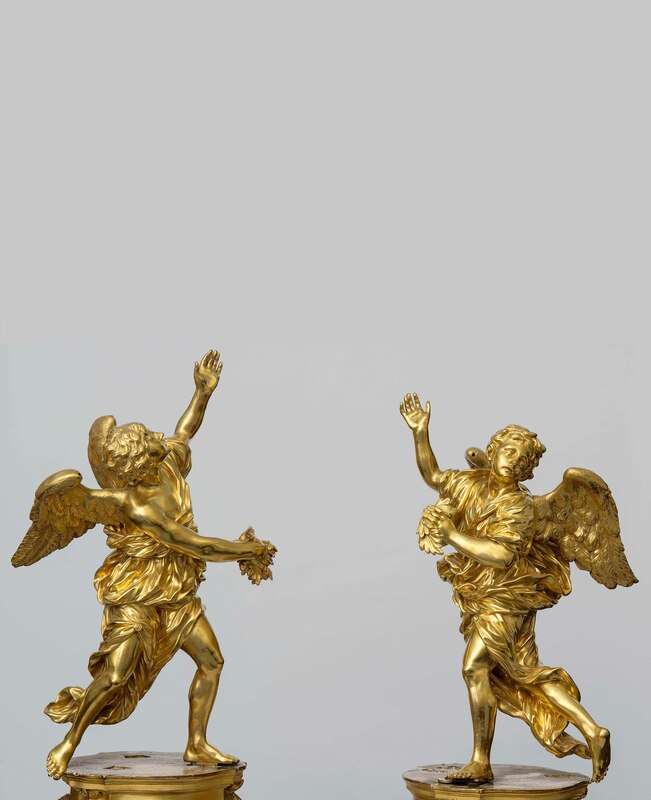 Giovan Battista Foggini (Firenze, 1652-1725), Pair of Angels (from the Reliquary of St. Nicholas of Tolentine), 1696; cast, chased and gilded bronze (angels); carved gilded wood (bases). Firenze, Palazzo Pitti, Museo degli Argenti. 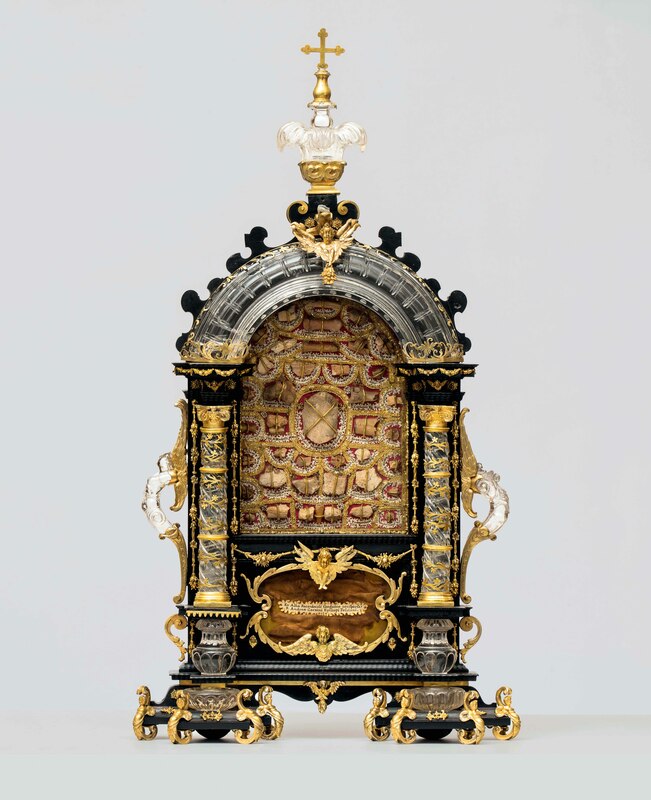 to a design by Giovan Battista Foggini (Firenze, 1652-1725), Reliquary of the Founder Saints, 1715; cast, chased and gilded bronze; cast and gilded copper; ground rock crystal; engraved semi-precious stones. Firenze, Museo del Tesoro della Basilica di San Lorenzo. 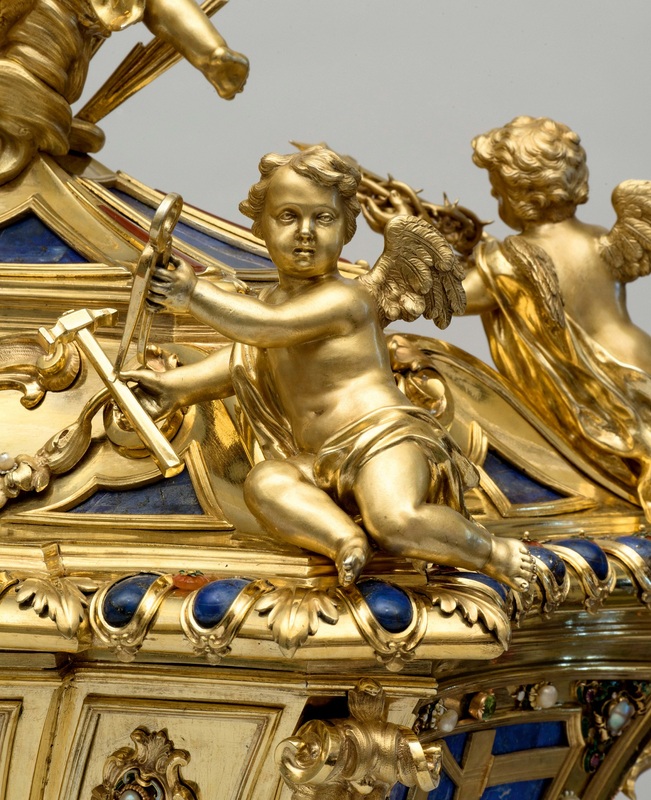 Giuseppe Antonio Torricelli (Firenze, 1662-1719), Bernardo Holzmann (Firenze, news from 1685 – † 1728), Grand-ducal workshops, Reliquary of the Stone of Unction, 1714-1716; carved semi-precious stones; cast and gilded bronze; ground rock crystal; cut and veneered ebony; carved wood; engraved and gilded silver. Città del Messico, Collezione Pérez Simón. 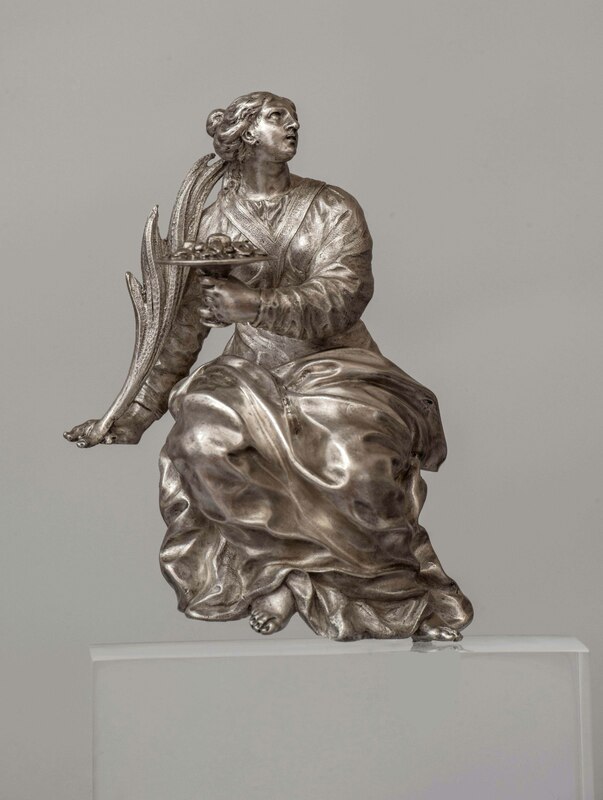 Giovan Battista Foggini (Firenze, 1652-1725), St. Dorothy from the Reliquary of the Patron Saints of Tuscany,1718; cast, engraved and gilded copper. Firenze, Palazzo Pitti, Museo degli Argenti. Cosimo Merlini the Younger (Florence, news from 1692 – † 1736), Maximilian Gaigher (Florence, news from 1728-1780), Niccolo Vanni (Florence, news from 1726 – † 1736) to a design by Ferdinando Ruggieri (attr. 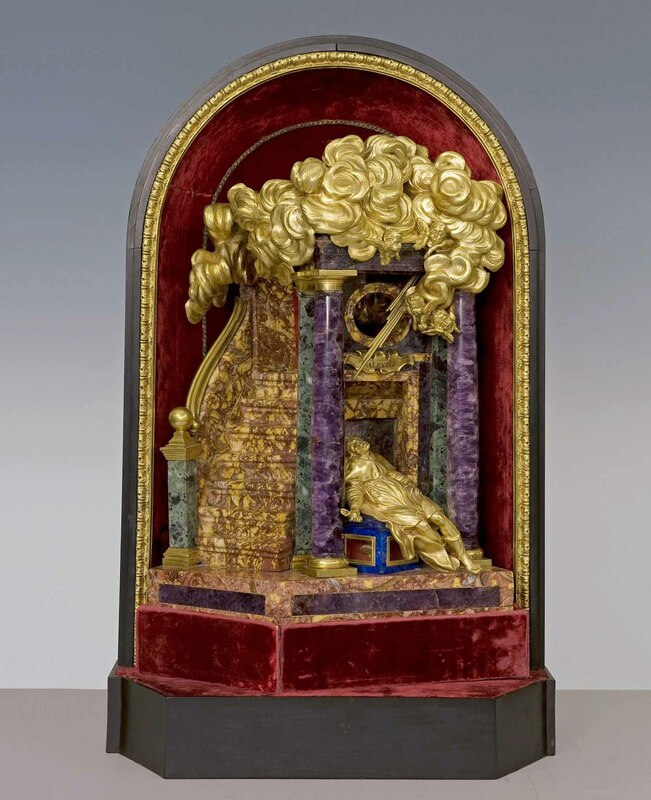 )(Florence, 1691-1741), Urn of the Holy Sepulchre, 1731-1735; repoussé, engraved and gilded silver, some parts cast; lapis lazuli, emeralds, cornelians, jasper, pearls. Detail. Cosimo Merlini the Younger (Florence, news from 1692 – † 1736), Maximilian Gaigher (Florence, news from 1728-1780), Niccolo Vanni (Florence, news from 1726 – † 1736) to a design by Ferdinando Ruggieri (attr. 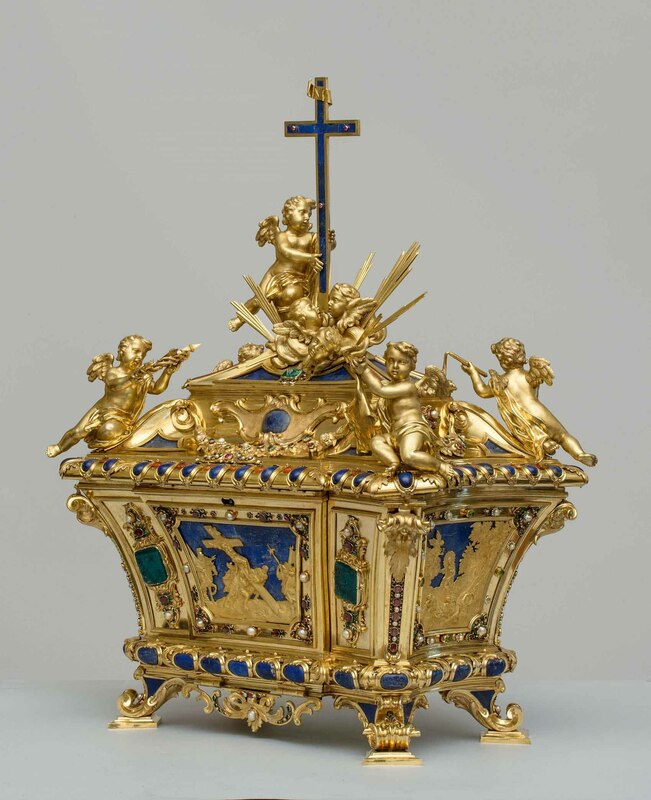 )(Florence, 1691-1741), Urn of the Holy Sepulchre, 1731-1735; repoussé, engraved and gilded silver, some parts cast; lapis lazuli, emeralds, cornelians, jasper, pearls.